A lot has been made over the last couple seasons of the Tampa Bay Lightning's salary cap management. Contracts like Ryan Callahan's and Braydon Coburn's left fans puzzled, as the need for dollars to re-sign players like Nikita Kucherov and Jonathan Drouin, among others, is significant. 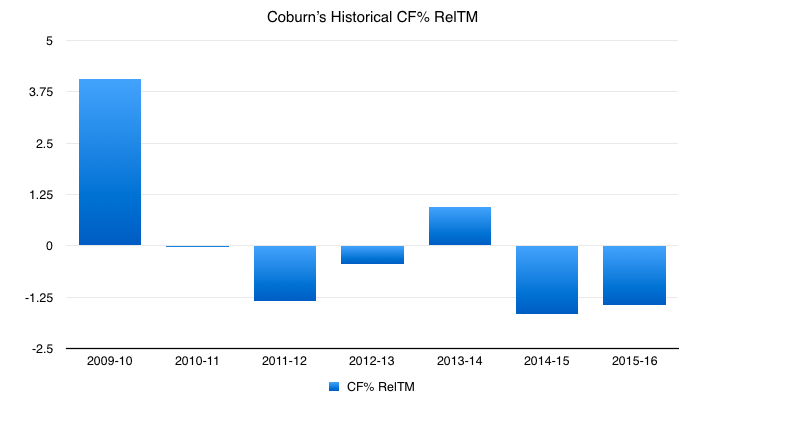 As much as the decision to sign Coburn to a three-year, $11.1M extension through the 2018-19 season left this blogger with a lot of question marks, his play on the ice this season has left me with anything but. In short, he's been an unexpected bright spot for a struggling Bolts team to start the year. In short, the trend over the past handful of seasons hasn't been pretty. 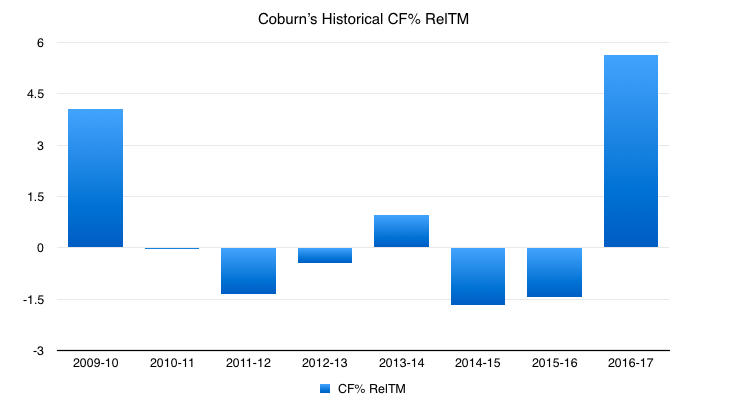 With the exception of 2013-14, Coburn has been a drag on team shot attempt share every year since 2009-10. The thought from many when the Lightning extended Coburn was simple: Did it make sense to use finite cap space on a now 30-plus-year-old defender who hasn't been a consistent driver of shot attempts for quite some time? Likely not. That paints quite the picture, doesn't it? Sure, it's partially attributable to the fact that the Lightning skaters around Coburn have been underwhelming compared to where they were in prior years, but the fact remains that Coburn is doing things right on the ice and helping his team create shot attempts at the other end of the rink. Is his start to 2016-17 an outlier? Almost certainly. Is it sustainable over the course of his three-year extension? Likely not. But, at this point, it's hard to criticize Number-55. In short, Braydon Coburn has performed admirably for the Lightning to start the 2016-17 season. While there are certainly lots of reason to have concerns about the team's play and their spot in the standings at this point in the year, Braydon Coburn's performance is not one of them. He's been everything they could reasonably hope for out of a $3.7M defenseman, and perhaps even more. Here's hoping he can keep it up.